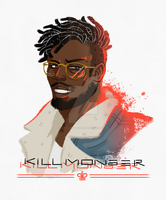 Sketchy bust I drew of Erik Killmonger before I saw Black Panther. I'm sorry I'm just now getting back to this but thankyou so much! Thankyou!!! My apologies for the wait! Save (in my arms)Once again I’ve been aiming to high. I really thought I would be so enthusiastic about this thing, that I would write, even if I had a lot work for school to do. Seems like it didn’t happen this way. I am deeply sorry. I am surely going to finish this project, but surely not before Civil War. This is the third part! Start with „Whose side are you on?“ and „Mission gone south“ before coming back. Warning in this one for sadness and probably uneasiness. Safe in your armsNatasha wakes up. She is in bed. She looks around room. Dim light, warm. Nice odor. There isn't anything in this room that can help. Then she realises that someone is holding her close. One arm is under her, just laying. Other one is on her shoulder, pulling her into his?, yes, his chest. Insticts are telling her to slice the person's throat, but something inside her heart says no. She focuses on the hold. It's warm, intimate, strong- but not enough to crush her. Natasha manages to shift and faces the person. He's awake. She examines the blue eyes smiling at her. They are warm, peaceful. Caring. He started moving. She doesn't know what to- he pulled her into his chest. There is only one voice, one person that holds her in that way. She curls up into his chest. She's feeling safe. She is safe.